Simple And Easy Home Office Decorating Ideas Are Brilliant! Home Deals These Simple And Easy Home Office Decorating Ideas Are Brilliant! These Simple And Easy Home Office Decorating Ideas Are Brilliant! Some people spend a great deal of time in their home office, yet this space tends to get the least amount of attention in regards to style and decor. Why not add a few touches of color and texture, while also creating functional and helpful organization systems in your office? Today, we are sharing two fantastic home office decorating ideas that are simple and easy to emulate right in your office! Simple And Easy Home Office Decorating Ideas! 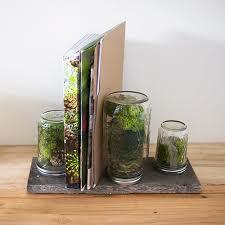 Create a letter/book holder that brings a bit of nature right into your office! items from nature (such as feathers, petals, pinecones, etc). Cut your wood to the desired length using the saw. Glue your mason jar lids together using the super glue and allow them to dry for approximately 15 minutes. Next, determine where you want to place your jars on the wood. If you want to use them to hold books, you want to space them out further. If you want them to hold mail and papers, place them closer together. Then, use the drill to screw the lids down into the wood. Then, fill the jars with your selected plants and decor. Finally, screw the jars into their lids and voila! If you use air plants or other similar plants you will need to open the jar periodically and mist the plants with water so they do not die! Check out these other awesome DIY office projects that you can easily do yourself! Follow the links to get detailed directions. Turn your small closet space into a tiny office! Find out how here. Create an awesome shared office space for two buy pushing 2 tables together! Learn more about this here.